What were the stories that lay behind these newspaper headlines from the Irish War of Independence? Who wrote them? What were their motivations and beliefs? Where did they get their information and how did they report on events? What attempts were made to manipulate these headlines? 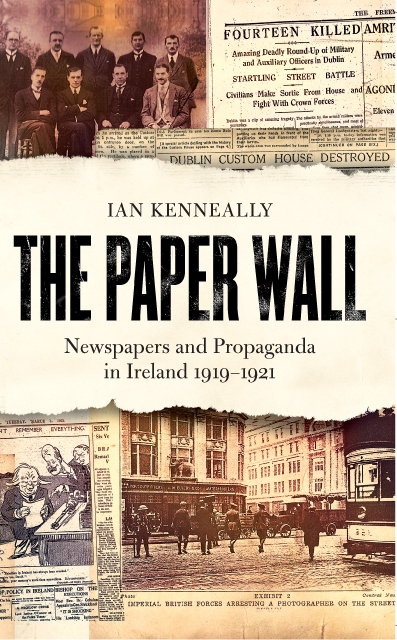 Using contemporary newspapers, archival sources and many newly opened files The Paper Wall attempts to answer these questions and bring a fresh perspective to the period from the first Dáil of 1919 to the Truce in 1921. Each day over 500,000 newspapers were sold to an Irish public eager to keep abreast of the latest dramatic developments and this book examines the role of five newspapers – the Irish Independent, Irish Times, Freeman’s Journal, Cork Examiner and The Times of London. These newspapers and their reporters were under constant pressure. The British Government established the ‘Public Information Branch’ in Dublin Castle while Dáil Éireann operated its own ‘Department of Propaganda’, both of which sought to influence and to control the press. Violent intimidation of newspapers was a common occurrence and newspapers offices around the country were attacked and badly damaged. Inevitably, the newspapers became not just a chronicler of events but a participant and sometimes a central protagonist. The Paper Wall highlights the vital role played by newspapers during these years. The book provides a clear and readable account of how the newspapers worked and reported amidst the storm of suppression, censorship, intimidation, propaganda, and violence. More information on the contents of the book and the situation in Ireland at that time can be found in the drop down menu at the top of the page. Currently out of print, the book is available in some bookshops or via sites such as Abebooks and Amazon.